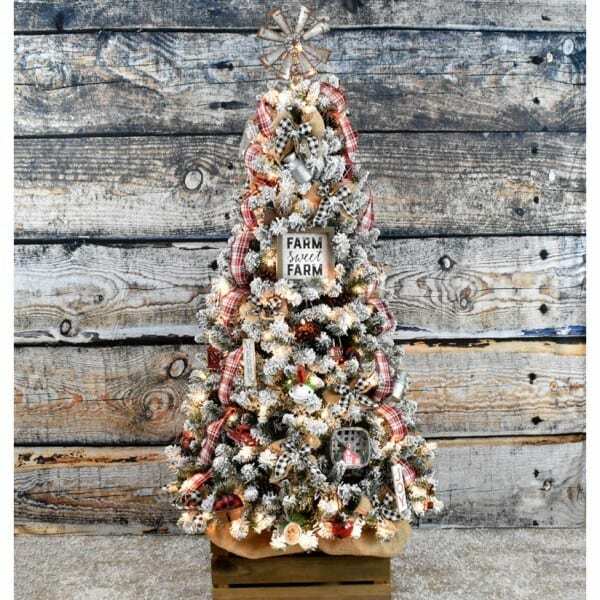 I’m so excited to show you my tree this year!! Isn’t it stinkin’ cute? 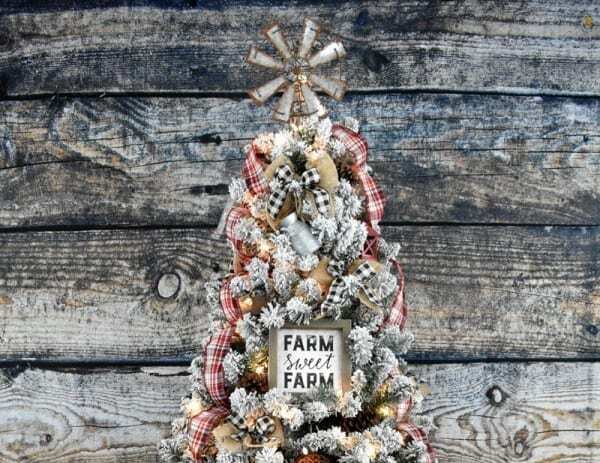 I adorned it with country and farmhouse ornaments, an adorable rusty windmill tree topper and a rustic wooden crate that I placed the tree in. 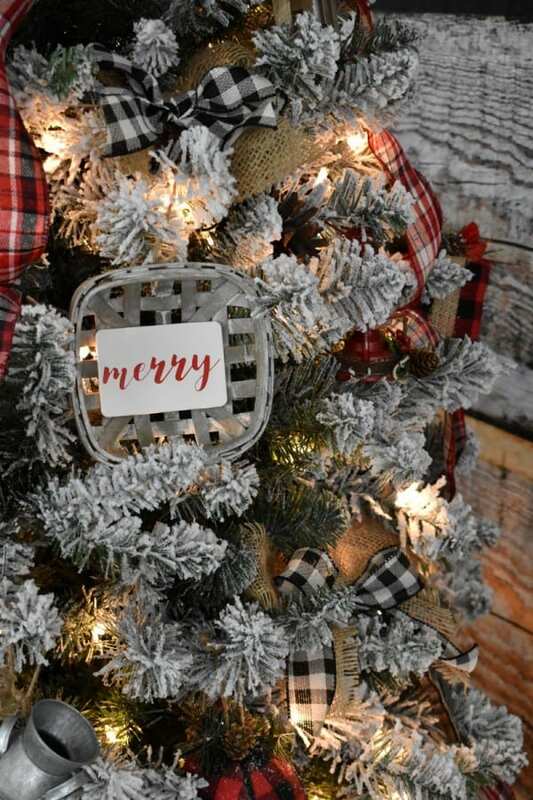 The combination of burlap, buffalo checks and plaid ribbon was the frosting on the cake! I had a lot of fun putting it all together. After my tree was finished, I was amazed at how beautiful it looked, especially after turning on all the lights. Lights always make a tree sparkle, don’t you agree? 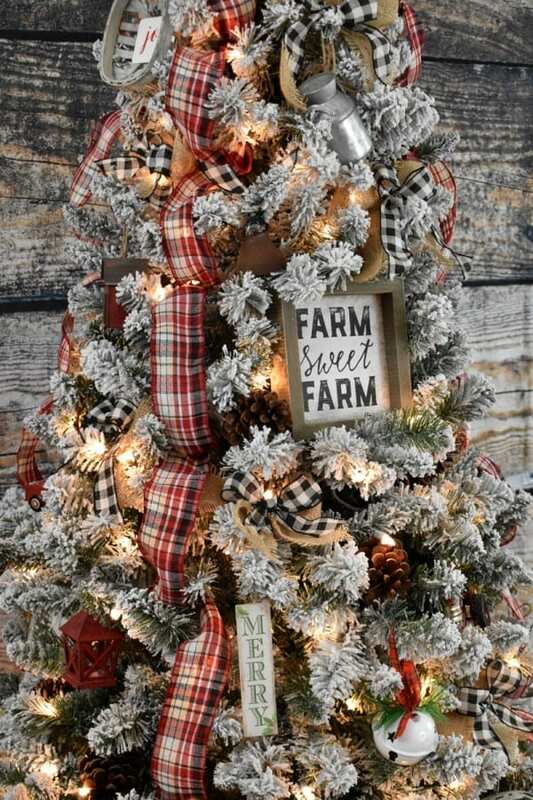 So, if you would like to make one similar to this one, I have a list of all my supplies, including ornaments and ribbons, and where to find them. 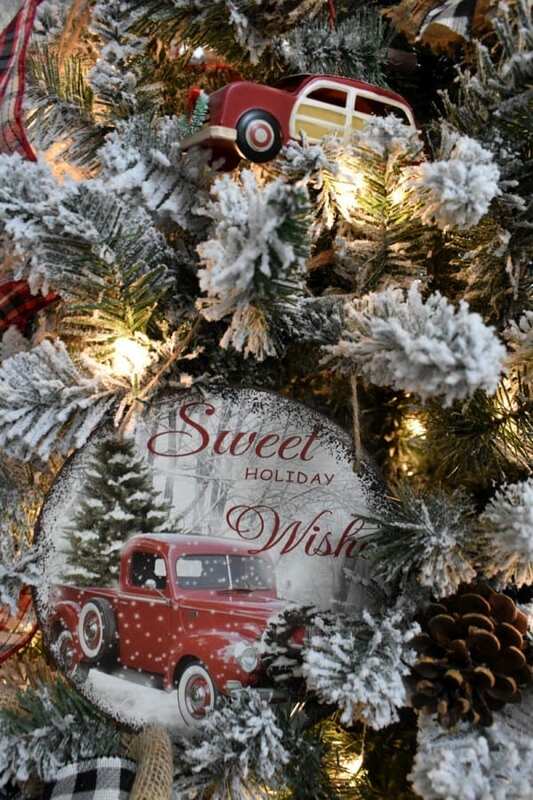 I hope you like this tree as much as I do!! 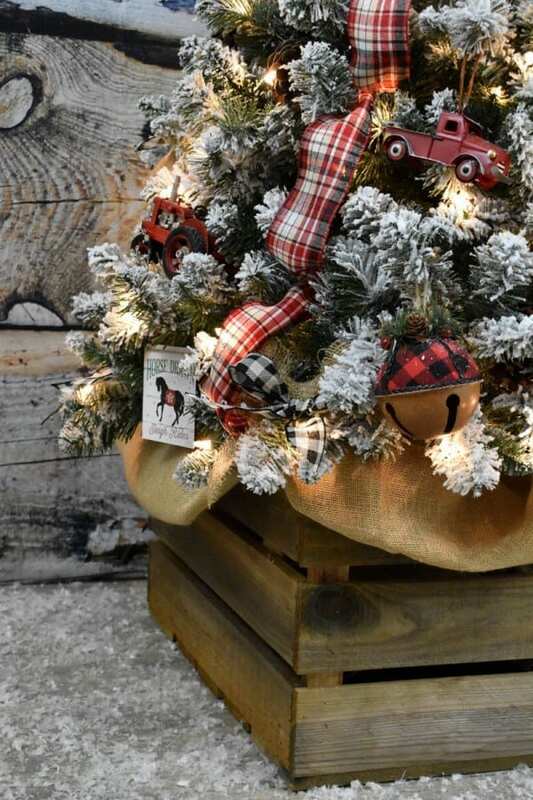 I used the $79 flocked, lighted tree from Walmart. It was cheap, but was really full and I loved the snow on it. The wooden crate, I made special to fit my tree stand. To see my tutorial on how to build a simple crate like mine, click HERE. 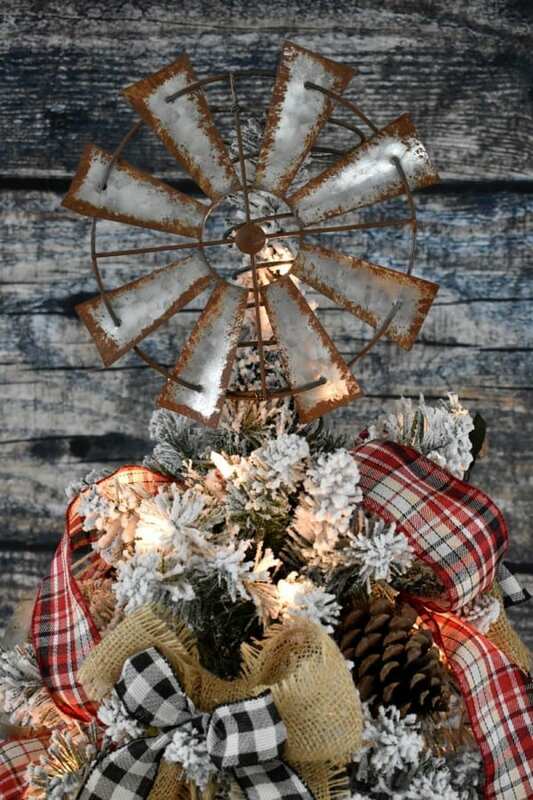 The tree topper is made of an old bed spring and the blades of a small windmill decoration. 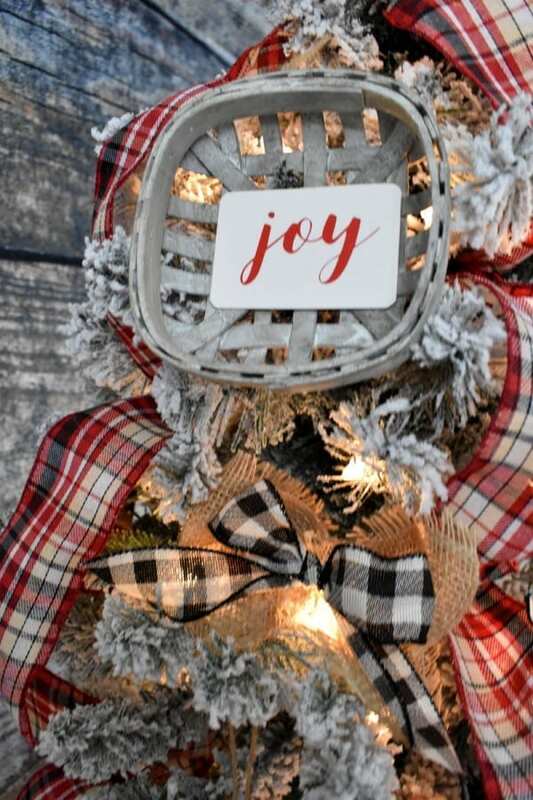 To see my easy tutorial on how I made this adorable tree topper, click HERE. I found the ‘Farm Sweet Farm’ sign at hobby lobby HERE. All of the ornaments I bought at Hobby Lobby, the 99 Cent Store, Walmart and Target. 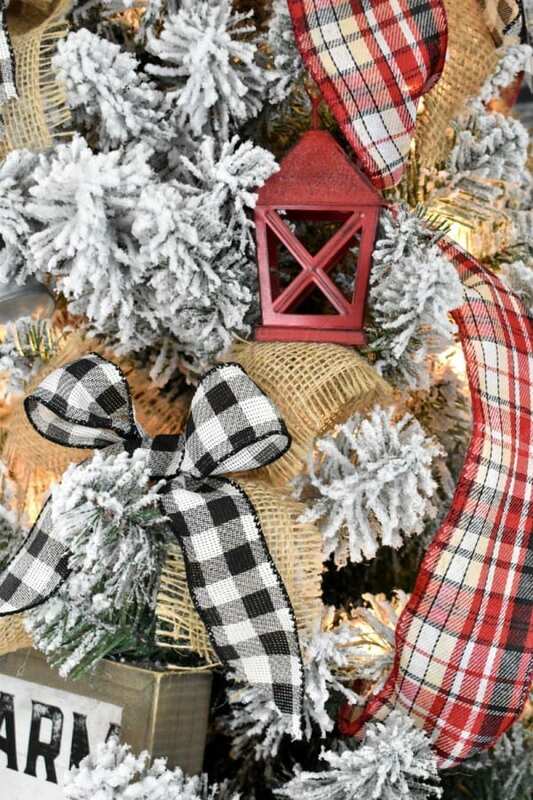 The burlap bows were made from frayed ribbon I found HERE, and the black and white buffalo check bows were made from wired fabric ribbon found HERE . You can also get them HERE. The black, red and white plaid fabric ribbon I found at Sam’s Club. To wire on the ribbon, just pinch one end tightly, then secure it to a branch at the top with a white pipe cleaner, hiding it the best you can. 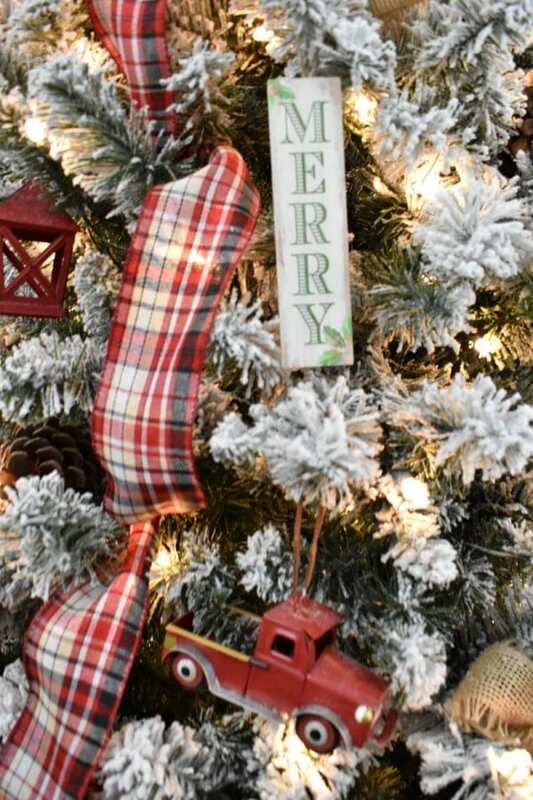 Next, measure down about 8 or ten inches of ribbon, scrunch and secure again to another branch a little lower on the tree, using another pipe cleaner. Make sure the ribbon is making a small pouf in between each of the pipe cleaners. Continue with this method until you reach the bottom where you will cut the ribbon, scrunch and secure it to the last branch. Repeat making four sets of ribbon rows total, each going down the tree in this same manner. To make the bows, tie a bow using the burlap ribbon as large as you wanted. Then, clip each end at an angle, then place it on a branch. 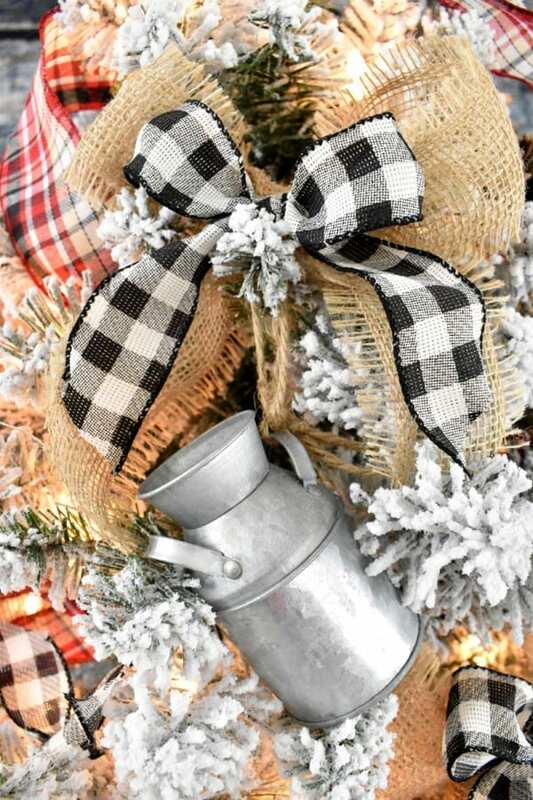 Do the same with the black and white ribbon, and place this ribbon bow on top of the burlap bow. You could hot glue the 2 bows together if you desire, but I left them unglued so I could use them in other projects later, if needed. 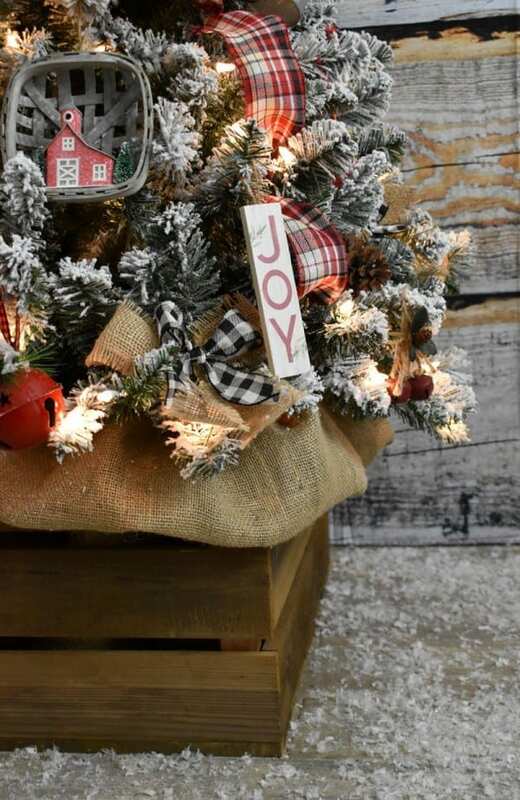 You can also tuck in a couple of yards of burlap, folded in half, around the bottom of the tree. Try to create a casual look by hanging the folded edge loosely over the edge of the crate with the raw edges tucked inside the rim. Now for more pictures! I love the windmill at the top! Isn’t it wonderful? There you have it! Now you can make one like it if you want to! I hope you enjoyed this post and would love to hear your comments! Merry Christmas! Really cute! 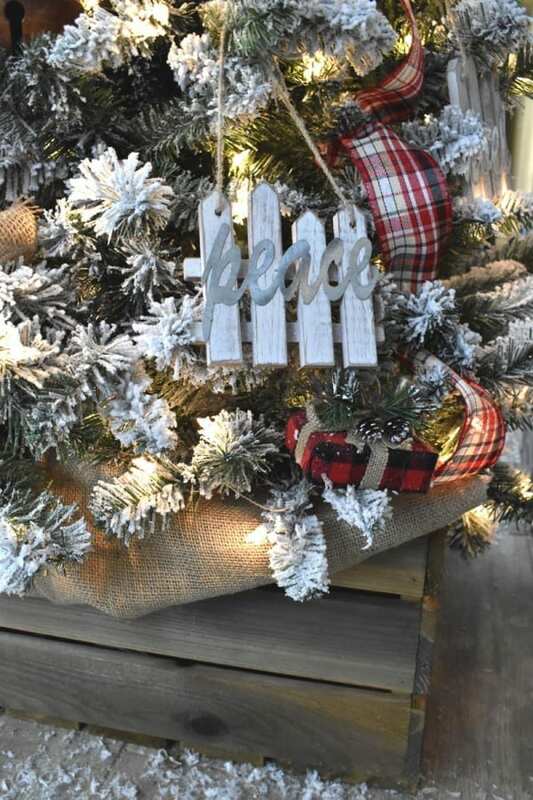 Love the mini basket ornaments. Visiting from Vintage Charm party. I love love love this tree! 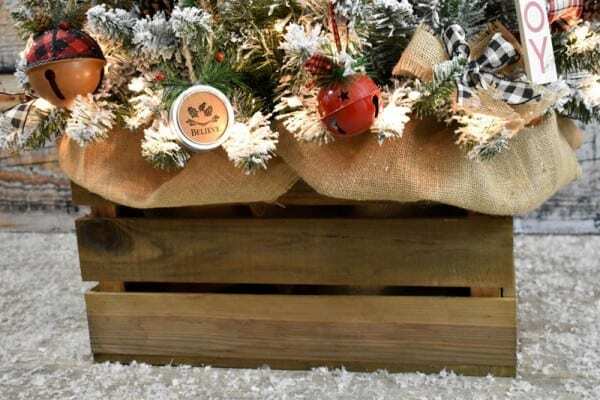 The untraditional ornaments are just wonderful and the crate for the base is just perfect. Thank you so much! I’m so glad you like it! You will have to post a picture of your tree next year! I would love to see it! 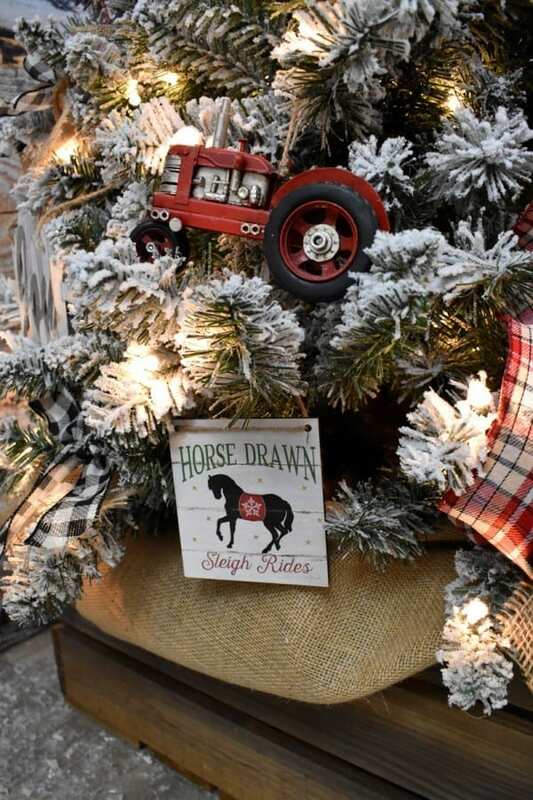 I love your tree–it’s absolutely charming! Thanks for sharing at Vintage Charm! 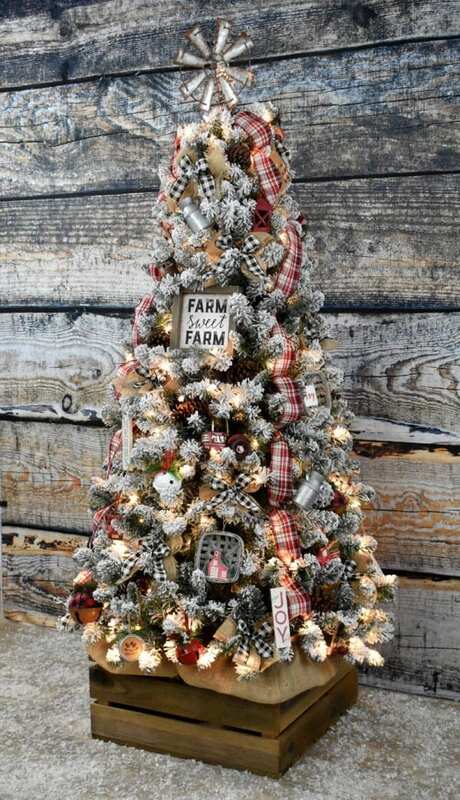 Love all the farm ornaments! Thank you! I appreciate your comments! I hope you will join us again for this week’s party. Happy New Year! Thank you for the sweet comments! It warms my heart to be featured on your site. Happy New Year to you and well!